Come and join us for FREE Pool + Snooker all day long! Enjoy a full day of all the best fun at your local Rileys. Loads of events for everyone will be available this Easter Monday so come and join the fun. Try our new food and drinks menu to keep you satisfied while you enjoy all the fun and games on offer. More information about further events will be added so keep your eyes peeled for a great day filled with fun! 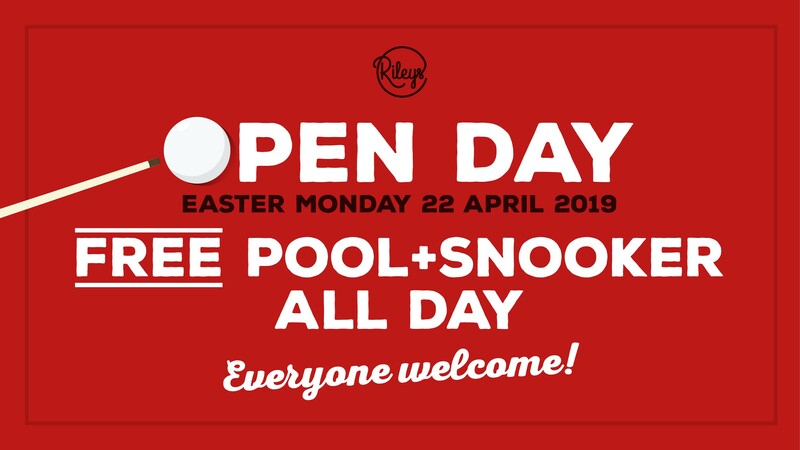 *T&C'S Rileys Open Day is valid for member and non members. In the event of our tables being busy free play sessions are limited to 1 hour, but you can join the waiting list for more time.